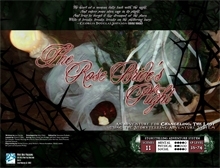 The Rose-Bride’s Plight is a new adventure for Changeling: the Lost from White Wolf Publishing. Written by Jess Hartley and Developed by Eddy Webb. This particular adventure can be run as a stand alone game or worked into an ongoing chronicle. There are tips and tricks provided for both types of games including suggestions for connecting existing characters to members of the local Courts and possible motivations for getting involved in local events. This adventure contains some new materials that will be useful for Lost games beyond this particular story, including a new system element, Unwitting Pledges, as well as a new Goblin Fruit, The Myrsina. Unwitting Pledges seems to be an over-complicated way of explaining that it is possible to “trick” someone into a pledge they may not have wanted to take part in. However, included in the write-up for the new system are some interesting notes on how many Changelings feel about formal vs. casual pledges and what is or is not “proper” when it comes to pledging. Still, some may find this new system element useful when they need a specific set of rules to guide them through those pledges that happen to be a bit tricky. The rules clearly state what the results should be and how to achieve them. The Myrsina is an interesting story element, but it also seems ripe for abuse. I do hope folks looking to take advantage of its existence will read the part about how rare the fruit is and even if their character has somehow heard of this “treasure” they will have a challenge understanding how it works (Intelligence + Occult -6 to have even heard of its existence). No one really remembers exactly what set Spring and Winter at each other’s throats more than 30 years to the past. The conflict was old by the time Warden took the throne. Any clear right or wrong has been buried under years of betrayals, back-stabbings, clandestine guerrilla tactics and petty arguments blown out of proportion for generations. While the rift has varied in depth and intensity over the years, recent history has done nothing to mend it, and tensions are at an all-time high. The wedding is a lace doily atop this freehold’s proverbial powder keg — a last ditch effort to make things right before they go totally to hell. So begins the adventure that will have the characters caught up in the conflict between these two Courts and the locals who have been scheming against each other for ages. The adventure seems to work best if the characters are guests from outside of town (but does include notes on working with characters who are members of the local freehold). Tragedy strikes, tensions flare and things could go from bad to worse unless the characters step in and help unravel this mystery. This eBook is packed with great setting material, including over a dozen fleshed out NPCs. Each of them has detailed notes on their history and useful Storytelling Hints. There is even a breakdown of how these NPCs feel about other members of the Freehold should the Player Characters happen to ask them for gossip or secrets. There are 11 Scenes detailed in this adventure (one of them is an optional Prologue) which will test the characters in a number of ways. With the amount of detail provided for the local Freehold and the NPCs involved there is plenty to keep the characters busy throughout the adventure and very little need to “railroad” the plot at all. If the characters are motivated to take part in these events the action will flow naturally as they get further involved in the plot. They will have to make some hard choices and there is a lot of opportunity for some great role playing throughout the story. There are character sheets included for the major NPCs and an extra blank sheet should the Storyteller feel the need to write up a few more. Print what you need, save on ink and paper. Visually there is a lot of artwork and plenty of pretty graphics throughout the document. There are links between the scenes and important sections of the text so you can hop directly to the related section of the work instead of having to scroll through every page. There is a great Aftermath write-up with suggestions on how to incorporate some of the NPCs into future storylines and opportunities for the Player Characters to have new allies and enemies for some time yet. This is one of the best looking and most detailed SAS products to date and a great addition to the Changeling: the Lost product line-up.